Abdominal compartment syndrome, a relatively recently identified disorder [1, 2], is traditionally managed in theatre with a semi-elective surgical decompressive laparotomy leaving the abdomen open . Fewer options exist, however, in patients who develop critical haemodynamic instability in the ICU. We describe the case of a 58-year-old woman admitted to the ICU with hypotension and abdominal distension. She had been discharged from the ICU 48 hours earlier after a prolonged admission with complications of a caecal perforation including ischaemic small bowel, fungal bloodstream infection and renal failure. On readmission to the ICU her abdomen was significantly distended without bowel sounds. Her haemoglobin was 88 g/l and lactate was 4.1 mmol/l. The patient was intubated, commenced on low-dose noradrenaline and taken for an abdominal computed tomography scan with oral contrast, which showed a large intraperitoneal fluid collection (Figure 1). Abdominal computed tomography scan demonstrating intraperitoneal free fluid. 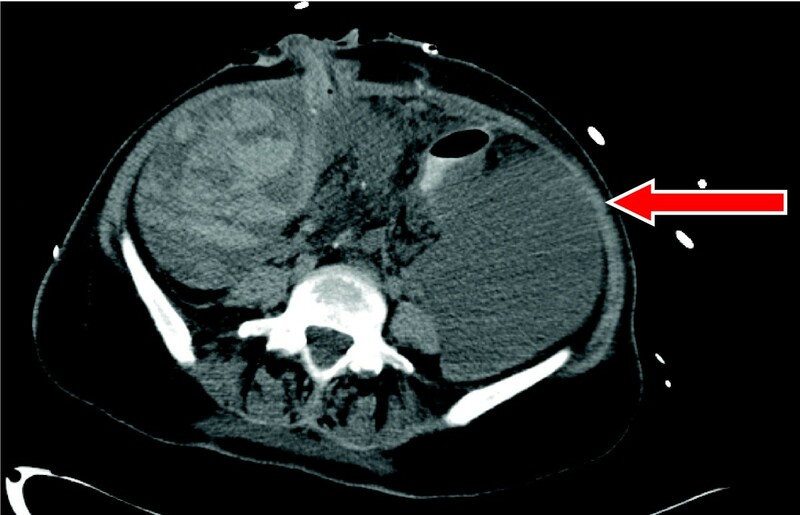 Arrow indicates site of mini-laparotomy. A pigtail catheter was inserted into her left flank, but <100 ml clear fluid could be drained. Critical haemodynamic instability soon developed, with her mean arterial blood pressure falling to 35 mmHg, despite escalating the noradrenaline infusion to 70 μg/minute, repeated adrenaline boluses of between 100 and 500 μg (2 g total), and additional fluid resuscitation via the central access. Given the dire situation, after urgent consultation and instruction from the surgeon (who was not in the hospital) by telephone, an immediate bedside mini-laparotomy was performed to decompress her abdomen. This was performed by the ICU registrar who had no formal surgical training. A left-sided 7-cm lateral scalpel incision was made parallel to the midline laparotomy, through the abdominal layers of skin, scarpa's fascia, muscle and peritoneum. Care was taken not to damage with abdominal viscera by making the incision away from the patient's stoma site and digital insertion through the peritoneal layer. After the peritoneum was opened, vigorous abdominal compressions were performed evacuating approximately 3 l of straw-coloured fluid. The patient's abdomen became less tense, her circulation improved and she was weaned off noradrenaline over the next 20 minutes. 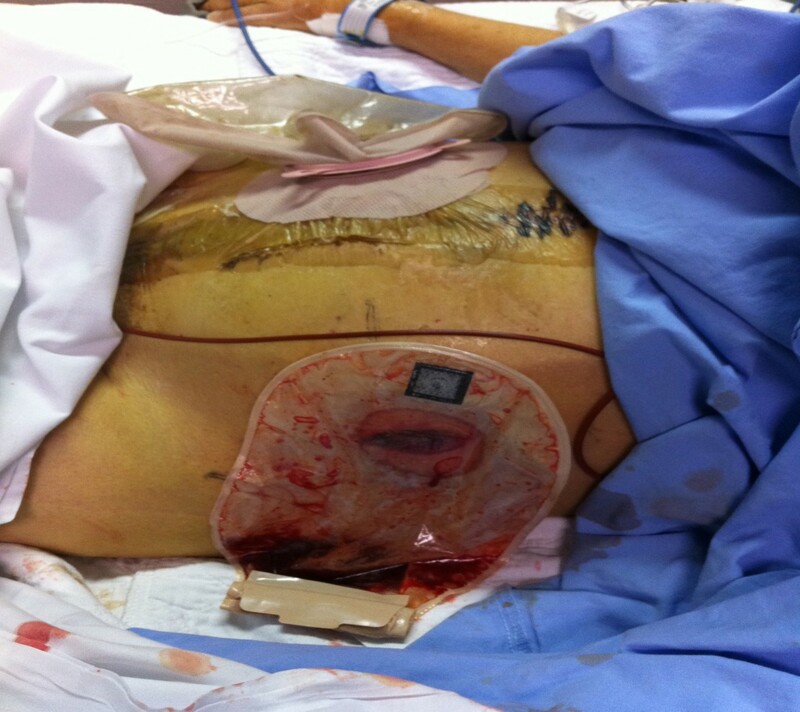 The incision was covered with a stoma bag (Figure 2) and a further 1.75 l were drained. Site of mini-laparotomy over the left flank. We describe a patient with abdominal compartment syndrome, secondary to tense ascites, which was a key factor resulting in the development of critical haemodynamic instability. An urgent decompressive mini-laparotomy resulted in resolution of the patient's haemodynamic instability. We wish to highlight that abdominal compartment syndrome is a reversible factor that can be corrected to prevent cardiac arrest. Written consent to publish was received from the patient's next of kin. TH, BD and RJW were involved in patient management. TH and BD drafted the initial report. All authors read and approved the final manuscript.